At Brit's Pub during the World Cup, who needs the U.S. when you have Mexico? The scene: About 300 fans, with a ratio of roughly 20 Mexico fans for every fan of Sweden, at the downtown Minneapolis bar known for its soccer gatherings. Wearing a yellow shirt and blue pants is a strange combination any day, but it became even more unfortunate when I showed up at Brit’s Pub as a neutral observer Wednesday to check out the soccer scene on a big day of World Cup action. The most intriguing match was Mexico vs. Sweden, the last of three in a very interesting group. And there I was, dressed in Sweden’s colors – like I was ready for a shift at Ikea, as one friend teased on Twitter. As it turns out, that wasn’t the only miscalculation of the day. Arriving shortly after the 9 a.m. start, for the first 30 minutes I sat in the bar area downstairs at Brit’s with a smattering – 10 on each side, maybe? – of Mexico and Sweden fans. A few Germany fans could be spied in an adjacent room watching their team take on South Korea in the other deciding match in Group F. The thought: Not a bad crowd for a Wednesday morning. Then a fan draped in a Mexican flag came downstairs. The thought: Hmmm, let’s go check on the scene up on the rooftop lawn. The scene: About 300 fans (by my estimation and that of Brit’s general manager Shane Higgins), with a ratio of roughly 20 Mexico fans for everyone one fan of Sweden. A huge crowd for a Wednesday morning. But for Mexico’s first two matches – both wins, both on the weekend – the bar had been near its capacity of 2,000, Higgins said. Brit’s has missed the United States this World Cup just as U.S. fans have, but supporters of England, Mexico, Colombia and Brazil have helped fill the void. Martinez, 48, posed for a picture – but first he put on his mask and shook his noise-making matraca. This being Minnesota, though, and Martinez having referenced the Super Bowl, I started to worry in the second half that a jinx was working against him and his fellow enthusiasts. Sweden scored early in the second half, sending the handful of their supporters up on the lawn into loud but contained celebration. A penalty kick goal made it 2-0, and an own goal later made it 3-0 Sweden. Mexico’s fans were quiet but not somber. In that Germany-South Korea match, with the defending World Cup champion Germans as the heavy favorites, the score stayed 0-0 as the match inched toward full time. A Germany draw or defeat would still send Mexico through to the round of 16 as the second-place finisher in the group, with Sweden finishing first and Germany being eliminated. It wasn’t the most likely path for Mexico to advance when the day began – all El Tri needed was a draw against Sweden to get through – but with each passing moment the probability grew. When Germany conceded a late goal – and then another – to South Korea in a stunning 2-0 defeat, Mexico’s supporters danced and celebrated all the same. It was the rare occasion when everyone (well, except for the handful of Germany fans) was happy. 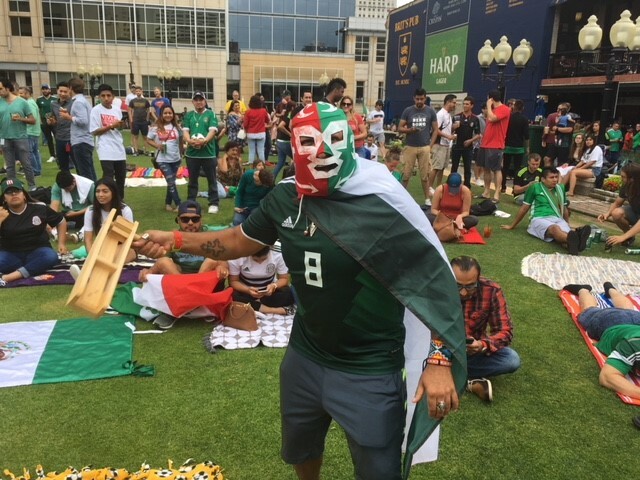 Mexico and Sweden advanced, and Brit’s got at least one more match – 9 a.m. Monday in the round of 16 – involving Mexico and its large local group of supporters. It was so much fun I’ll probably go back for more. But this time I’ll know where to look and what not to wear.